Hamza married Ruwayda. After the nikaah(wedding), Ruwayda's mother gave her a newly opened bank savings book with a R2000 deposit amount at the local Islamic Bank. - 2 Jan:R200 Hamza became Hafizul Qur'aan. - 7 Feb: R300, Ruwayda's Dad took us with for HAJ. However, after years, they started fighting and arguing over trivial things. They didn't talk much. They regretted that they had married the most nastiest people in the world... no more love... Kind of typical nowadays, huh? The next day, Hamza gave the book back to Ruwayda. She found a new deposit of R5000...and a line next to the record: 'This is the day I notice how much I've loved you through out all these years. How much happiness you've brought me.' They hugged and cried, putting the savings book back to the safe. "When you fall, in any way, Don't see the place where you fell, Instead see the place from where you slipped. Life is about correcting mistakes." "If you are grateful, I will surely give increase My favours unto you" (Quran-Surah Ibrahim 14: 7). 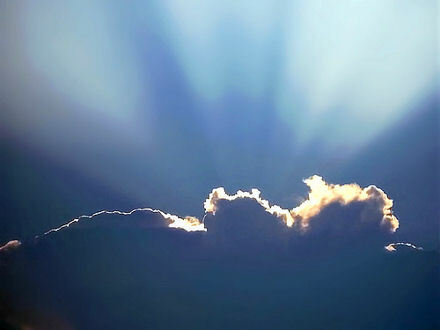 "Behind every Dark Cloud there is a Silver Lining"
The Islamic New of 1434 has recently ushered in, people, generally, begin to think about their life and some even make resolutions about how they will approach this New Islamic Year and their work, health and relationships. As humans and believers we also have ambitions. Instead of making resolutions only about material progression, the resolutions of a believer would and should be about one's progression on the path of enlightenment and nearness to the Creator Allah Ta'ala. In reality we don't need a New Year or special occasion to make a resolution for doing or achieving good. It can be done instantaneously! "The Festive Season" : As Muslims How Should We Approach It? As the "festive season" (Christmas/New Year) approaches many people are preparing to celebrate. This preparation often includes many practices that are unacceptable such as alcohol, illicit drugs, music, dancing, partying till midnight,fireworks,free intermingling of sexes, adultery and other acts of disobedience. We as Muslims need to ask ourselves a very fundamental question, should we be involved in this celebration at all? The answer to the question is a very definite NO. A pious scholar as aptly said: "...For temptation will lead you into trouble and make you cry." Indeed, this is exactly what happens when one gives into the temptation to engage in any Haraam (act of disobedience) and you will feel there is a distance between yourself and the Almighty ALLAH, know that HE hasn't moved an inch, you have! Many Muslims have been led astray by the dazzling attractions, never to return there from…Many loose their identity during this "festive period" and sometimes even their Imaan and suffer the loss of their Aakhirah(Hereafter). Therefore, don't let the chains of desire bind you to Dunya, whilst restraining your soul from pursuing Jannah. Distance oneself from the dens of sins and endeavour to participate in good, Deeni programmes and associating with the pious. Deen and Shari'ah do not stifle us, do not deprive us of pleasure and enjoyment, do not deny us happiness and celebration. Our beautiful Deen and Shari'ah accommodate leisure and pleasure. Islam is indeed Most Beautiful. Islam is not 'dry' and "kill joy". It is "cool" and enjoyable. Our beloved ALLAH TA'ALA has only placed certain boundaries through HIS Divine prohibitions for our own benefit, safety and well-being. This holiday period is a time of great test and trial. Don't let Salaah become a forgotten duty and discard Islamic dress and identity so that there is freedom to engage in these haraam celebrations. Those who celebrate this day will surely endure ALLAH'S anger. What would be the condition of that person whose soul is extracted engaged in evil and who comes face to face with the Angel of Death whilst engaged in drink, dance, raves adultery or fornication? Evil and shamelessness is a sin and a characteristic of evil people. The Messenger of Allah(peace be upon him) tells us that "modesty comes from Eeman (faith)." (Hadith-Sahih Bukhari) Therefore, a dearth of modesty is a reflection of a scarcity of Eeman. ►Let us not forget that we are Muslims. ►Let us not forget our relationship with ALLAH TA'ALA. ►Let us not forget that death can visit very unexpectedly. ►Let us not forget that there is accountability. ►let us not forget Jannah(Paradise). The Messenger of Allah, peace be upon him, said, "The world is a prison for the believer and a paradise for the unbeliever. "(Hadith-Sahih Muslim). What will be 'good' for the disbelievers will not always be good for the Believers. If they find enjoyment in Haraam(evil), the Muslim will find HARM in that same Haraam. We must seek refuge in ALLAH from the Evils of this festive season. Death seeks us all. Prioritize your Deen. If we adopt Taqwah, we restrain and abstain from disobedience to ALLAH TA'ALA, then when we leave this world, we leave behind a prison, we leave free. When the disbeliever leaves this world, he leaves behind his paradise. When he leaves this world, he enters a prison; wherein there is no escape. The SIGNS OF THE LAST DAYS ARE APPARENT and we are closer to them than we think! We do not know what the next day will bring, will the next day be our last or will it bring happiness, only ALLAH knows best. With no guarantee we should realize that our lives are in the hands of ALLAH TA'ALA and we should do only what HE has prescribed for us, and that is to WORSHIP HIM. "This worldly life is a just a moment; let it be a moment of obedience." May ALLAH TA'ALA guide us and grant us the ability to celebrate our happiness in the light of Sunnah and make us amongst the obedient ones, Aameen Ya Rabb! "(I make) Allah responsible for your deen, your trustworthiness and for the results of your actions". "May Allah make piety part of your journey, forgive your sins and fulfil the purpose of the journey". "O Allah, let his journey be covered quickly and most easily". "I leave your responsibility to Allah (leave you in his hands) in whose protection nothing can be lost (destroyed, damaged) when He protects". "O Allah, it is with Your help that I attack (the enemy) and with Your help I defend and with Your help I depart". "O Allah, You are pure, surely I have oppressed myself so forgive me for You are the only One Who forgives sins". After reciting this it is Mustahab to smile. "O Allah, we seek goodness from You and piety from this journey and (the ability to do) good actions by which You are pleased. O Allah, ease this journey for us and make us transverse the road quickly. O Allah, You are our companion in this journey and deputy (guardian) over our household whom we left behind. O Allah, I seek refuge in You from the difficulties of the journey and from seeing bad things and from a bad return at home and household and from the dua of the oppressed". Note: It is Mustahab to perform two rakaats Nafl Salaat before commencing a journey. بِسْمِ اللَّهِ مَجْرَاهَا وَمُرْسَاهَا إِنَّ رَبِّي لَغَفُورٌ رَّحِيمٌ . وَمَا قَدَرُوا اللَّهَ حَقَّ قَدْرِهِ وَالْأَرْضُ جَمِيعاً قَبْضَتُهُ يَوْمَ القِيَامَةِ وَالسَّمَاوَاتُ مَطْوِيَّاتٌ بِيَمِينِهِ سُبْحَانَهُ وَتَعَالَى عَمَّا يُشْرِكُونَ . "In the name of Allah, it moves and stops. Definitely my Lord is forgiving and merciful and the Kuffar have not recognised Him as they should, whereas on the Day of Qiyamah the whole earth will be in His fist and the skies folded in His right hand. He is Pure and Superior (lofty) from the belief which the Mushrikeen hold (have)". "I seek refuge in Allah by His complete words from the evils of the creation". By reciting this dua, no harm will befall on the person. "O Allah, You are the Lord of the seven skies and all the things that are under these skies and the seven planets and whatever is over these and of Satan who misled and all those misled by him and for the wind and all that it blows. Thus we seek the good of this town and the good of its members (people) and seek refuge from its evil and the evil of its members and from the evils of whatever is in it". "O Allah, You grant us good in it (the city/populated area)". "O Allah, grant us the fruit of this place and create love in the people for us and create love in our hearts for the righteous people (of this area)". "Oh Earth, your Lord, and my Lord is Allah. I seek refuge in Allah from the evil (of your nights) and those evils created in you and that which moves in you and seek refuge in Allah from the lions, snakes, scorpions and from the evils of the dwellers of the city and from the father and children". "The heaven has heared our praise of Allah and also heard our testification that He favours us and keeps us in good condition. Our Lord stay with us and grant us your favours and I make dua to seek refuge from Allah from Jahannam (hell fire)". It is also narrated that this dua be recited three times in a raised voice. Prophet Mohammad (S.A.W.) stated that if a person on journey refrains from worldly affairs in his heart and focuses his attention to Allah and remembers Him, the angels stay with him throughout the journey and if he recites imaginary poetry or does any futile thing then Satan stays with him during his journey. Every Surah should commence with "Bismillah" and Surah Naas should end with "Bismillah" as well, thus reciting "Bismillah" six times. Jabir (R.A.) states: "When I went out on journey (and although I was wealthy and had more merchandise than my companions), my conditions were worse than them, but from the time I began reciting these surahs, on return my condition was better than all of them, and I had most provisions of the journey". "There is none worthy of worship besides Allah who has no partner, His is the Kingdom and to him is all praise, for He has created everything. We are those returning, repenting and obedient to Allah, performing Sajda, praising Allah, Allah has made truth (fullfilled) His promise and aided His servant and defeated the enemy armies Alone." "We are returning, repenting and obedient to Allah, praising Him". Prophet Mohammad (S.A.W. )'s blessed habit was to return from a journey during chast time within the city. He would first go to the Masjid, perform two rakaats Salaats. Thereafter he would stay in the Masjid for a little while and then go home. Prophet Mohammad (S.A.W.) loved to journey on Thursdays. "I have come back, I have come back, I seek forgiveness from Allah with such a repentance that leaves me with no sin".